More than 1.5 years into their exploration of Mars, both of NASA's Mars Exploration Rovers continue to send a cornucopia of images to Earth. The results are so spectacular that Deputy Project Manager John Callas recently described them as "an embarrassment of riches." Spirit produced this image mosaic, nicknamed the "Whale Panorama," two-thirds of the way to the summit of "Husband Hill," where the rover investigated martian rocks. On the right side of the panorama is a tilted layer of rocks dubbed "Larry's Outcrop," one of several tilted outcrops that scientists examined in April, 2005. They used spatial information to create geologic maps showing the compass orientation and degree of tilting of rock formations in the vicinity. Such information is key to geologic fieldwork because it helps establish if rock layers have been warped since they formed. In this case, scientists have also been studying the mineral and chemical differences, which show that some rocks have been more highly altered than others. In the foreground, in the middle of the image mosaic, Spirit is shown with the scientific instruments at the end of its robotic arm positioned on a rock target known as "Ahab." The rover was busy collecting elemental chemistry and mineralogy data on the rock at the same time that it was taking 50 individual snapshots with its five panoramic camera filters to create this stunning view of the martian scenery. The twin tracks of the rover's all-terrain wheels are clearly visible on the left. 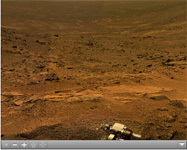 This mosaic of images spans about 220 degrees from left to right and is an approximate true-color rendering of the Mars terrain acquired through the panoramic camera's 750-, 530-, and 430-nanometer filters. Spirit collected these images from its 497th martian day, or sol, through its 500th sol (May 27 through May 30, 2005).